A new year and new fair trade products! One of these days I’ll make it to the NY NOW gift show–which is the most popular and successful for Fair Trade Federation member exhibitors–but for now I’ll continue to attend virtually. This winter’s NY NOW show takes place February 4th through the 8th. I asked the FTF NY NOW exhibitors what’s new and why its special. This is the first batch of responses — keep an eye out for more posts in the upcoming weeks! The ink was barely dry on my email request when I heard back from Nancy Dunitz at Dunitz & Company. “We’ve been using recycled and upcycled denim to create jewelry,” Nancy wrote. 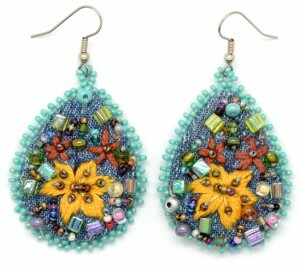 “And we’ve been decking it out with all kinds of embroidery and beadwork. We call it out “Frida Collection” because we know that if Frida Kahlo were living, she’d be just the person to wear it! Of course, the look is retro and very 60’s too. Our line is handmade in Guatemala.” Dunitz & Company is located in booth 542 at NY NOW in the Global Handmade section. I love seeing new fair trade clothing items and Sevya provides some lovely eye candy with the Devyani printed cotton kaftan, from Indian artisans. “The designs were inspired by various things,” writes Joan Rasch. “Some are inspired by mosaic work in palaces in India, and the weaves and embroidery patterns are inspired by traditional sari weaves and motifs. We work with weavers, block-printers, tie-dye and embroidery artisans in each region of India and draw a lot from their traditional sari patterns and then tweak them a bit for a more contemporary look.” Sevya will be at booth #334 in Global Handmade. I’ve seen amazing bags from Manos Zapatecas, and am thrilled to see the high quality woven fabric in home décor items including rugs and pillows. Hannah Aronowitz writes, “We are excited to be able to present the “Primavera” color palette from our MZ Casa Collection, a curated selection of rugs and pillow covers. Our Primavera family of rugs and pillow covers brings the warmth of spring into your space with a subtle splash of color and designs that evoke the natural beauty of Oaxaca. Watery blues, sage and mint greens, dusty rose, earthy red and tan dominate the Primavera palette, to bring just the right combination of calming cool tones and gently energizing warm hues to your home. Manos Zapatecas will be in booth #131. Abrazo Style also works with artisans in Oaxaca (and Chiapas) but on a whole different product line. “Abrazo Style creates contemporary designs showcasing the rich artistic traditions of Mexico,” writes Adele Hammond. Abrazo Style is a new member to the FTF in 2016 so if you haven’t met Adele, visit booth #426 in Global Handmade (upstairs.) I’m hoping she’ll be at the FTF Conference in March so I can pick out an embroidered blouse! 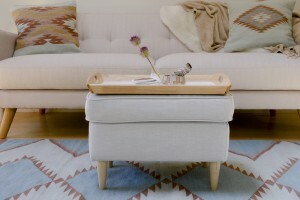 And more new homewares from Sustainable Threads! “We are launching a new line of hand block printed kitchen towels this show season,” writes Poonam Abbi. “The organic cotton kitchen towels have contemporary geometric patterns, in fun colors made using water based inks (all goodness!). Handmade by a physically handicapped artisan group, this range was co-designed by designers from India, Europe and United States! Imagine Skype conversations across continents!” Hopefully we’ll be getting some of these for the Global Crafts Showcase. 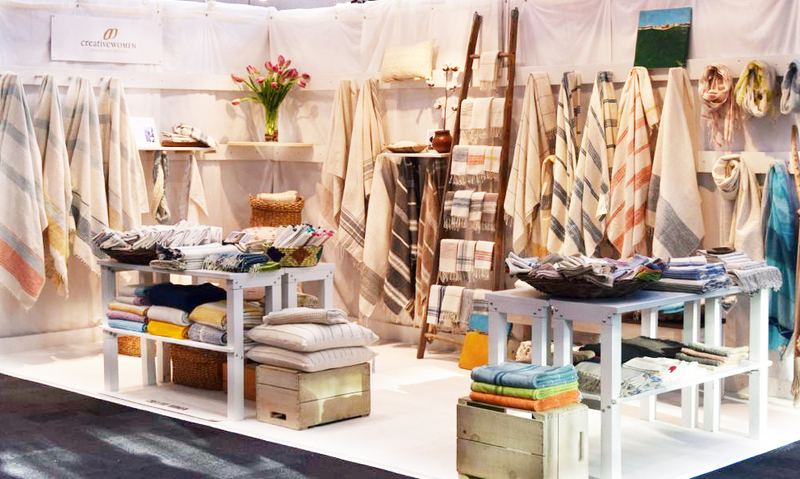 Find Sustainable Threads in booth #406 in Global Handmade AND in Furnishings and Textiles in booth 2472. While keeping with their mission of working with artisans that create beautiful textiles from handspun fiber, Creative Women is expanding. 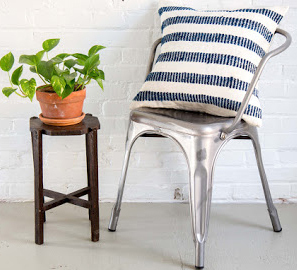 “We’ve just added new pillow covers to the line and will debut at NY NOW,” Maura Kroh writes. “We added these because most of our items are made in Ethiopia and we’re trying to expand into new parts of the world. These are made by a great artisan group in Guatemala.” The women use the backstrap loom to make the fabric. Creative Women will be in booth #201. A long time NY Now exhibitor, Maggie’s Organics is the place to find “high quality, affordable organic apparel and accessories that are both kind to the environment and the workers who produce them,” writes Cassandra Malmquist. “Designed by women, for women – clothes that flatter, empower, and prepare you for everyday adventures. The comfort of lush Peruvian Organic Cotton that can be worn to work, parties, and for hiking your favorite trail. 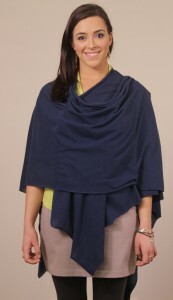 Endless versatility for life’s spontaneity.” The Mesh Poncho is just one of the many items in the Spring (yes, Spring!) catalog. Check out the new socks that are debuting exclusively at the show. Maggie’s will be in Personal Accessories, booth 8470. Another Global Crafts Showcase partner, Silk Road Bazaar always has new designs of its “Zooties” and we are looking forward to adding the adult line. 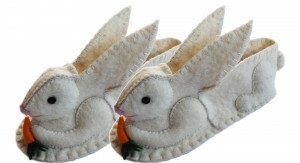 “Our slippers, following in the spirit of Zootie Cuteness, are adorable woolen slippers for women,” writes Andrew Kuschner. “Each slipper is cut, stitched, and adorned in wonderful animal detail; they are layered to provide durability and are soled with a rubber non-skid surface. The slippers idea really came out of the trade shows – prior to the slippers we only carried the infant size, but after the 100th ‘I wish that came in my size’ we decided to bite the bullet and design an analogous collection of slippers to match our Booties.” Look for the new designs of Mama Rabbit, Dalmatian, Golden Retriever, and Penguin. Silk Road Bazaar will be in booth #137, Global Handmade. “After the success of our Sloth Friends Mobile, we had to add cute little Pandas to the Global Goods Partners family,” writes Chrissy Kim. “With all the charm of the real big fuzzy animal, they are the perfect bedside companion. 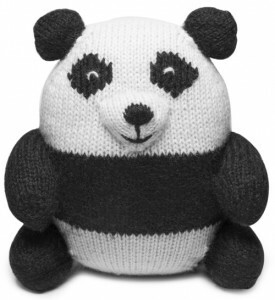 Hand knit by Peruvian artisans with the softest Alpaca yarn, these pandas love to make friends and be toted around from couch to kitchen to playground (on the hunt for bamboo).” Not only is there a plush panda toy, but also very clever panda mobiles. Global Goods Partners will be in both #204, Global Handmade. I imagine the colorful batik designs of Global Mamas are always eye candy for the trade shows. “We decided to start with a new product this year, which is also targeting a younger market,” writes Jess Bowen, who’s new to the Global Mamas’ team but not to Fair Trade. 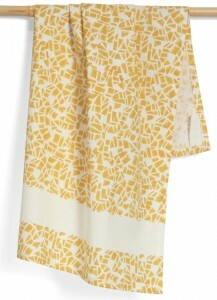 “The Coastal Skirt is versatile, with an elastic waist back and a tie in the front that allows the wearer to leave the front waist more flat, or gather it in for a fuller skirt. 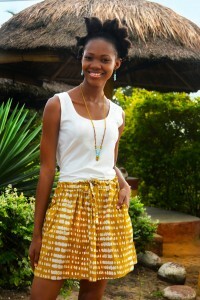 The skirt can be worn at natural waist for a shorter look or ride on the hips for more coverage. We are offering it in a variety of trend-right colors for Spring/Summer 2017.” Look for Global Mamas in Booth 237, Global Handmade. A product line that is even more astonishing when you see it in real life, Quilling Card greeting cards with designs made of rolled paper never cease to amaze me. “Quilling is a roar-some time! 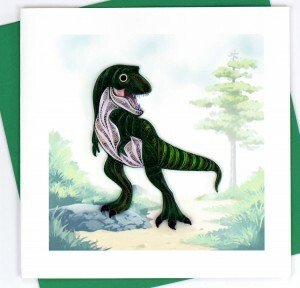 Who doesn’t love a good Dinosaur,” says Huong Wolf, Quilling Card’s co-founder of their new T-rex card. The design ideas seem endless! To see for yourself, visit the Quilling Card in booth #531, Global Handmade. I’m looking forward to hearing from more fair trade exhibitors for next week’s Think Thursday blog! Thank you for including us :)!